Attraction Introduction: Dining and a show in New York is a great way to spend the evening. 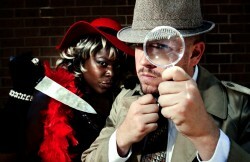 Check out the The Murder Mystery Company in New York, NY. Word from the bird is this is one show you will not want to miss. This night is shootin’ to be swell despite the disaster.Ladies, bows and pins in your hair will go nicely with your puffy sleeved prom gowns. Gents, you will look sharp in white and black suits or tuxes. Get ready to put on your thinking caps; you’ll need your wits about you to solve this crime. Visit their web site for show times and locations as well as ticket purchases.